Aug. 30, 2016, 12:28 p.m.
By Joseph Lichterman @ylichterman Aug. 30, 2016, 12:28 p.m. The Amazon Echo sitting on my nightstand comes to life and proceeds to play NPR’s latest newscast. As I force myself out of bed to shower, brush my teeth, and get dressed, the Flash Briefing goes onto play a 90-second mini culture podcast from Slate, an update on the presidential race from The Washington Post’s Chris Cillizza, and some local Boston news from the NBC-owned NECN. Some mornings, I’ll even ask Alexa to pull up a stream of WBUR, the local Boston NPR affiliate. Regardless of how I decide to use it, the Echo has enabled me to multitask in the morning instead of wasting my time lying in bed reading tweets or straining to hear my overworked iPhone speakers playing the news. The Echo is Amazon’s 9.25 inch-tall cylindrical voice-powered speaker. It’s controlled by Alexa, the company’s AI software, which has become available on other devices as well. Amazon launched the Echo in November 2014 and it became widely available for purchase in June 2015. Since then, the device has gotten rave reviews and prompted many people to think about how voice-activated technologies can be used more prominently in the home. News is one of the device’s core features, and a variety of publishers are trying to determine how their work might best fit on it. There are two main ways — so far — that outlets can utilize Alexa: the Flash Briefing and skills. Flash Briefings are a passive experience, which are perfect to listen to while getting ready in the morning or while cooking dinner. Using the Alexa app on their phone, users choose a lineup of updates they want to receive and then ask Alexa to play it whenever they want. That’s it. Briefing channels are typically about 90 seconds long. Skills, meanwhile, must be installed by the user but can have a more active interface — including asking Alexa for specific pieces of information. For example, The Washington Post (owned by Amazon CEO Jeff Bezos) has built two skills: one that covered the Summer Olympics and another focused on its political coverage. There are many non-news skills as well; Alexa users can play Jeopardy, get workout instructions, and more. Last Thursday, Amazon announced that it was enabling streaming audio skills on Alexa, meaning users will be able to stream and control audio playback in skill form, which could allow for better integration of podcasts or other audio news playback. As my own behavior illustrates, the Echo can be a useful tool for news. I wanted to know, however, how the news outlets themselves were approaching yet another distributed platform. Over the past few weeks, I’ve spoken with five different news organizations about how they’re using Alexa. Because the platform is so new, all the publishers I spoke with categorized their forays onto the Echo as experimental. For outlets working with Amazon to publish on Alexa, the first decision to make whether to create a channel in the Flash Briefing or a skill. Many publishers have decided to focus, at least initially on the more straight-forward Flash Briefing, but a handful, including the Post, have created their own skills. As it developed its skills, the Post assigned a designer to the project to help work out some of the user interface challenges, said Joey Marburger, the paper’s director of product. For instance, if you had asked the Post’s Olympic skill for the swimming results during the games, it wouldn’t necessarily know what you’re asking for. Instead, you’d have had to specify by event by requesting, say, the results for the women’s 100-meter backstroke. “By that point, I could’ve found that information much quicker and faster in other places,” Marburger said. The Post has found that the skills are better for requesting quick-hit information, such as the latest polls or the Olympic medal count. And even when you spend the time and resources to develop a skill, there’s a chance Amazon might just usurp you and integrate similar functionality directly into Alexa. That happened to the Post just after it launched its Olympic skill. So instead of having to specifically ask The Washington Post for Olympic results, users could just say, “Alexa, give me the latest Olympic medal count” and get the answer more quickly. Even though the Post is owned by Bezos, Marburger said it isn’t getting any special treatment when it comes to Alexa. Those complications led many outlets, especially those that are able to repurpose existing coverage, to focus on the Flash Briefing and find different ways to try and differentiate themselves in that area. While other news orgs’ Flash Briefing offerings are tied to the news cycle, Slate wanted to create a product that was more explanatory and not necessarily about the news. What it created, 90 Seconds With Slate, is essentially a short podcast hosted by culture editor Dan Kois. For now, it’s posted every other day, but Kois said he hopes to increase the frequency. Kois said he typically records each episode in one take with a hand mic attached to his iPhone. Recent episodes have covered topics such as a four-hour Bruce Springsteen concert and Tim Kaine’s Replacements fandom. Slate head of product development David Stern said the show was developed in just a matter of weeks after Amazon approached Slate about launching something for Alexa. Most of the publishers I spoke with don’t have dedicated Alexa teams — they’ve incorporated Alexa production into staffers’ existing workflows. Newsy, the digital video outlet owned by Scripps, launched an audio-only app, Newsy Radio, last fall. It expanded to Alexa in June, and it produces 10 to 12 updates per day for the platform. Newsy’s updates are read by its radio hosts; three to five stories make up a 90-second edition. Refinery29’s Flash Briefing offering is an audio version of its morning news roundup, which is published in a native iOS app and on its website. The challenge for the site’s staffers is to figure out how to to convert something written to be read into something delivered audibly. To create the Alexa version, Refinery29 added an extra field in its CMS; the editors creating the post tweak the writing to create the Alexa version of it. The NBC stations and Refinery29 both use Amazon’s text-to-voice technology for their flash briefings. The computer doesn’t sound as natural as a human, of course, but both outlets said they’re working with Amazon to help it improve Alexa’s pronunciation. For the Flash Briefings, the publishers said Amazon sends regular reports with the overall listens and the number of unique listeners. None of the outlets I spoke with would share specifics about how many users were utilizing or subscribing to their Alexa products. When it comes to the skills, Marburger said there’s a developer dashboard that shows how many unique users are utilizing the skill and then which parts of the skill were being used. While all the publishers I spoke with are focused on growing audience on the Echo, some have begun to look for ways to monetize as well. In July, the Post became the first publication to sell ads in its Flash Briefing. Marburger said the Post asked Amazon if they could advertise on the platform. Marburger said the company had no issues with it, and suggested best practices. The paper’s product team then shared those with its ad sales team. “Here are our recommendations: Make it short — make it max 10 to 15 seconds. The shorter the better. Think of it like a radio-style sponsorship. There’s a little burner between a radio show, ‘Brought to you by Morgan Stanley’ — think of that. Try not to do a preroll video style ad. We constrained what they could do there. We weren’t sure whether any advertiser would take that because it’s so new, even though we were also touting that you could be one of the first people to sponsor a channel on Alexa,” Marburger said. Outlets like Newsy and Refinery29 said it was still too early for them to discuss advertising, but Slate said it was already in talks with advertisers to see if it could find a sponsor for its Flash Briefing show. Every publisher I spoke with stressed that it’s still very early days when it comes to publishing on the Echo and Alexa. But as Amazon spreads the Alexa software to additional devices and consumers become more comfortable with connected home devices, the outlets said they expect the appeal of voice-controlled news to grow. 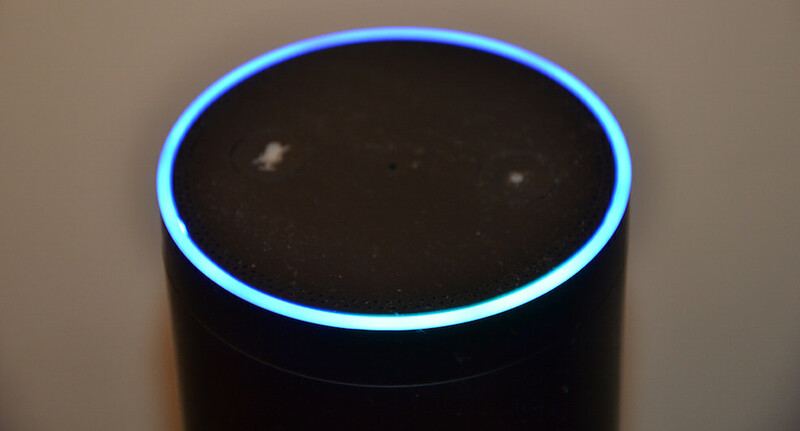 And whether its additional Flash Briefing offerings or additional skills, all the publishers said they plan to continue to experiment with Amazon and Alexa. “Frankly, we’re a little bit bullish on voice,” said Refinery29’s Conway. Photo by Ken M Erney used under a Creative Commons license. POSTED Aug. 30, 2016, 12:28 p.m.
Lichterman, Joseph. "Alexa, give me the news: How outlets are tailoring their coverage for Amazon’s new platform." Nieman Journalism Lab. Nieman Foundation for Journalism at Harvard, 30 Aug. 2016. Web. 23 Apr. 2019. Lichterman, Joseph. "Alexa, give me the news: How outlets are tailoring their coverage for Amazon’s new platform." Nieman Journalism Lab. Last modified August 30, 2016. Accessed April 23, 2019. https://www.niemanlab.org/2016/08/alexa-give-me-the-news-how-outlets-are-tailoring-their-coverage-for-amazons-new-platform/.